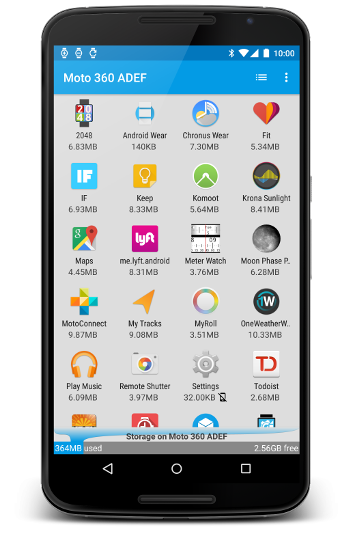 Wear App Manager's headline feature is to show all your Wear OS apps - and only your Wear apps - in one convenient location. The app list screen is where it happens. Choose from a list or grid-based layout, and sort the apps by name, size, or date. 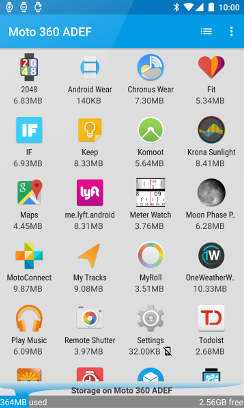 See at a glance which apps may be missing their wearable-side components, or if any are only on your watch. Maybe you’d get more functionality from also having the phone companion for some of these? I'm so over this app! 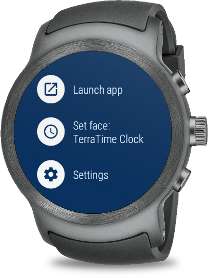 Please be aware that some functions are not available on Android Wear 1. Most notably, uninstalling apps directly from your Wear device is only supported on Wear 2. 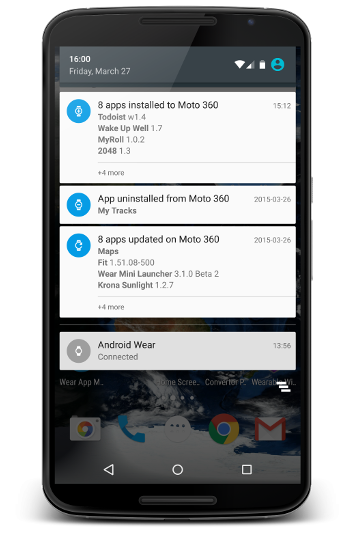 In addition to all its interactive features, Wear App Manager also keeps tabs on installation activity, and notifies you whenever an app on your watch has been installed, updated, or uninstalled. The notifications are clean and concise, letting you know what’s changed (and when) in an easy-to-read format. On Wear OS 2, the notifications also give you direct actions you can take on the newly-installed app, like launching it or setting any of its watch faces. They're also completely configurable. Just go into Settings in the WAM app (on your phone or tablet) to select exactly which app events you want notifications for, and on which device. 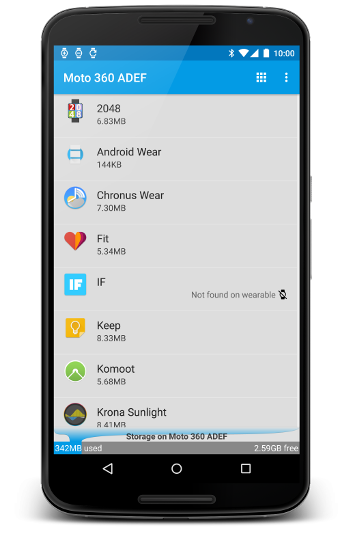 Wear App Manager exists to aid in the management of apps installed onto an Wear OS device linked to your phone. As such, a Wear smartwatch is a requirement for using the app, although there are no restrictions as to which Wear smartwatch you have. And of course, you will also need the prerequisites associated with Wear generally (Google’s Wear OS app, a phone or tablet that supports Google Play Services, etc.). On Wear OS 2, these are installed as separate apps. They can be done in either order, but if you install the phone app first, your watch should prompt you to install its piece automatically, so that’s the way we recommend to go. 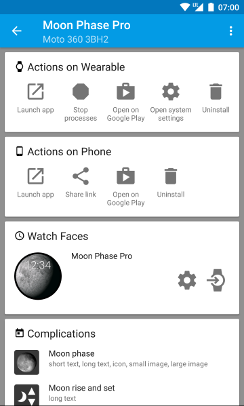 If that doesn't work, go to the app launcher on the watch – from the watch face, press the watch's side button – and open Play Store. Down at the bottom is a section labeled Apps on your phone, and Wear App Manager should be in there. If not, you may have to go find it; tap the green Search button at the top of the main Play Store screen, then search for wear app manager (or just manager, even). Once that finds the app, press Install. 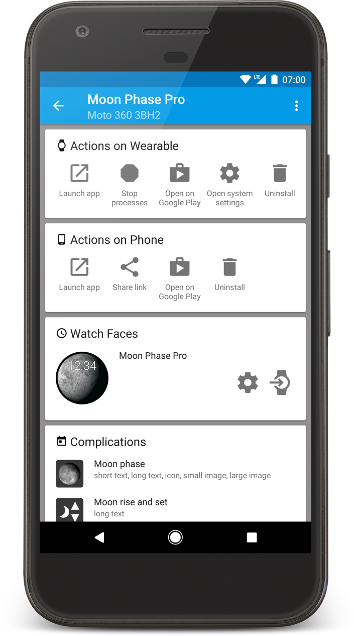 On Android Wear 1, there’s a single package which contains both the handheld and wearable components, installed onto your phone (or tablet) just like any other app. The Wear system should then detect the presence of an embedded Wear app, and push that piece to the linked smartwatch automatically. If this doesn't happen automatically, it's possible to "encourage" it by opening the Wear OS app (on the phone/tablet) and selecting Settings > Resync apps. This process may take a few minutes for all the app components to be synchronized. Bottom line: install Wear App Manager’s phone/tablet app from the Google Play button below, and you’re on your way! Once the app is fully installed, the user interface for Wear App Manager is almost entirely on the phone (or tablet) side; there’s not currently an activity to launch on the wearable. So run the app on your handheld, it will start by showing you a list if your Wear apps, and you can go from there. Copyright© 2014 and beyond Udell Enterprises Inc.